Recent interest among policymakers in helping Social Security Disability Insurance (SSDI) beneficiaries return to work has increased the in desire for knowledge about the employment activities of people with disabilities before they apply for benefits. Learning about the participation of applicants in programs designed to support employment and provide income supports may offer opportunities for early intervention to enable them to remain employed. 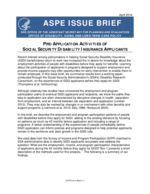 In this issue brief, we summarize results from a working paper, conducted through the Social Security Administration's (SSA's) Disability Research Consortium, on the experiences of SSDI applicants before they apply for SSDI (Thompkins et al. forthcoming). Although relatively few studies have uncovered the employment and program participation paths of eventual SSDI applicants and recipients, we know the paths they take to application are often characterized by disruptive changes in health, separation from employment, and an interval between job separation and application (Lindner 2013). They may also be marked by changes in or involvement with other benefits and support programs (Livermore et al. 2010; Daly 1998; Honeycutt 2004). In this brief, we describe the employment and program participation patterns of people with disabilities before they apply for SSDI, adding to the existing literature by focusing on patterns as much as 42 months before application and including a range of programs. A better understanding of the experiences of people immediately before SSDI application can inform policies and programs designed to help potential applicants remain in the workforce and stem growth in the SSDI rolls. We used data from the Survey of Income and Program Participation (SIPP) matched to SSA administrative data to identify SSDI applicants accurately and address the question: What are the employment, income, and program participation characteristics of applicants during the 42 months before they apply for SSDI? Box 1 presents a short description of the methods used for this analysis.1 The following is a summary of our findings. For this analysis, we pooled data from the 1996, 2001, and 2004 panels of the SIPP, a nationally representative sample of the non-institutionalized civilian population 15 years old and older. Respondents are interviewed once every four months for the duration of the survey panel. SIPP contains information on demographic characteristics, employment outcomes, and program participation of each respondent. We linked these data to SSA administrative files to identifying SSDI application dated, SSDI receipt, and Supplemental Security Income (SSI) receipt. Not all SIPP records could be matched to SSA administrative data; the match rate for panels ranged from 60 percent to 84 percent. The statistics presented here therefore represent lower-bound estimates and could be biased if non-matched respondents systematically differ from matched respondents by SSDI receipt or application status. Using the SSA administrative data, we excluded people who received SSDI benefits as of the first SIPP wave and identified initial SSDI applications up to six years after the first SIPP wave. The sample for this analysis was restricted to people ages 25-55 whose first survey response occurred in wave 1 and who applied for SSDI benefits within six years of the first SIPP interview. The analytical methods incorporated descriptive statistics, measured at a point in time or across six-month intervals, and comparative statistics (such as t-tests) to determine statistical significance. To improve the precision of our estimates, we show data only for statistics with at least 50 observations across all three panels. Data are weighted using SIPP panel wave 1 weights.